Srimati Sitadevi is an incarnation of the Lord’s pleasure potency and thus an expansion of Srimati Radharani. She is an example of perfect devotion to the Lord. 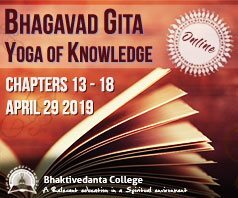 In Srimad Bhagavatam 9.10.55 it describes, “Mother Sita was very submissive, faithful, shy and chaste, always understanding the attitude of her husband. 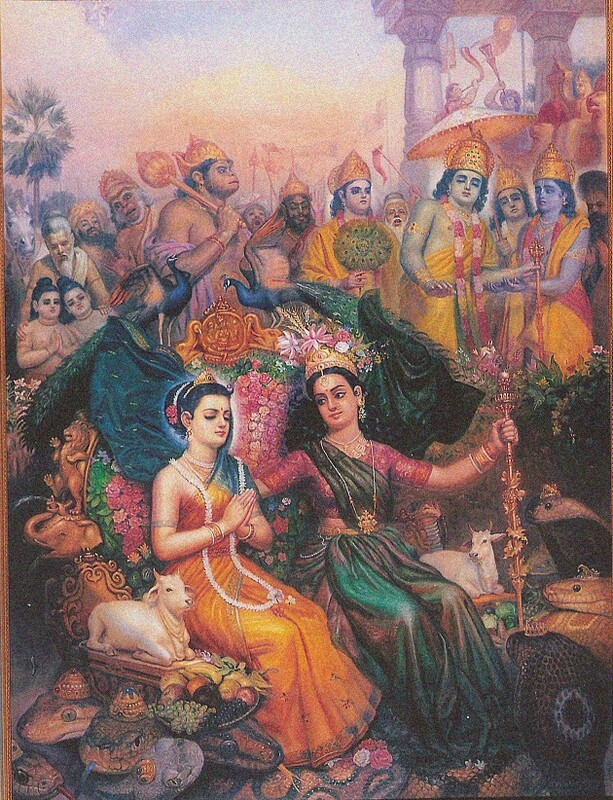 Thus by her character and her love and service she completely attracted the mind of the Lord.” She desired nothing but to please and serve Lord Rama, and although she was raised as a princess with the best of comforts and opulences she insisted on following Him into an austere life in exile in the forest rather than remaining behind in the palaces of Ayodhya. This is the way of pure love: pure devotees of the Lord do not care for any personal comfort or hardship, they care only for the comfort and pleasure of the Lord. The central storyline of the Ramayana revolves around the battle for Srimati Sitadevi. Ravana’s consuming desire to possess and enjoy the most beautiful Sita puts him in opposition to Lord Rama, who performs many miraculous deeds and ultimately destroys Ravana in order to rescue His wife Sita. How could the best of devotees, Srimati Sitadevi, be kidnapped by a demon and taken away from the Lord? It seems inconceivable that the Lord would allow such a thing to happen, but the Lord performs many extraordinary pastimes for the benefit and edification of people in general. Through this pastime, the Lord demonstrates the difficulties people go through due to family attachment; Lord Rama was seemingly greatly distressed by the loss of His wife Sita, and seemed to go through immense difficulties to rescue her. The Lord also shows the futility and the danger of trying to enjoy that which is meant to be enjoyed by the Lord; Ravana caused his own destruction in his eagerness to use Sitadevi for his own material enjoyment, not understanding that she, the pleasure potency of the Lord, is meant for the Lord’s enjoyment only. 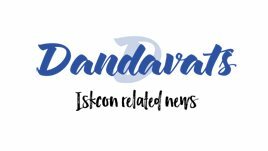 It is impossible for a materialistic person like Ravana to touch Srimati Sitadevi, just as it is impossible for anyone within the material world to enjoy the energy of the Lord no matter how they try to exploit it for their own pleasure. What Ravana touched was illusory, just as the enjoyment of those in the material world is only an illusion that leads to suffering. Devotees of the Lord, however, honor, respect, and worship Srimati Sitadevi, knowing her glorious position and praying for her mercy.